In this update I'll be starting with the installation of the new valve covers that UPS recently dropped off at my house. After a lot of looking around I decided to go with a set of Billet Specialties cast aluminum valve covers with a ball milled pattern on their tops. I also ordered a set of matching breathers to go with them, but those are currently on backorder so I'll have to wait a few weeks for them to arrive. 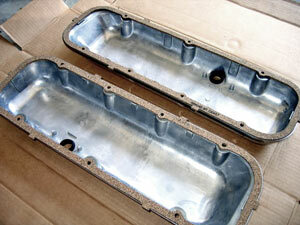 Along with the new valve covers I purchased a new set of cork gaskets. While installing the valve cover gaskets I had to trim the tabs on the gaskets just a bit to fit the notches in the valve covers. After a bit of trimming to get the proper fit I used a bit of Gasgacinch on the valve cover flange and back side of the gasket. 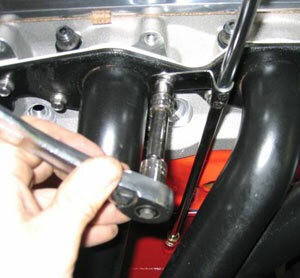 Once the Gasgacinch set up I carefully placed the gaskets in position and pressed them into place. 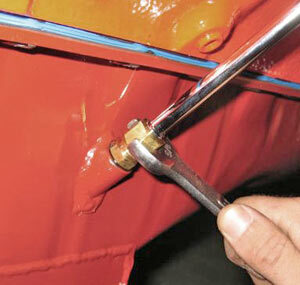 Using the Gasgacinch is a great way to keep the gaskets in place while installing the valve covers. 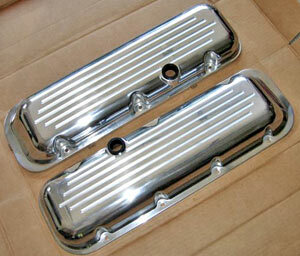 The actual installation of the valve covers was a piece of cake, simply put them in place and install the necessary bolts. For fasteners I used a set of 12 point polished stainless steel bolts made by ARP. For now I only installed a few bolts on each valve cover. Before initial startup of the motor I'll want to remove the valve covers so that I can pour some oil over the valve train. 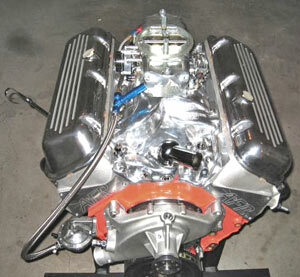 Once that's done I'll install the remaining valve cover bolts and torque them to specs. Next on my list of odds and ends was getting the oil dipstick installed. The Moroso oil pan that I'm using has a threaded dipstick fitting and as a result the installation wasn't as simple as just sticking the dipstick into the hole in the oilpan with a bit of sealant. To save myself some hassle I bought a dipstick kit from Moroso that included all the necessary parts to complete the install. I probably could have bought all the parts I needed at the local hardware store and saved a bit of money, but for the extra $4 the Moroso dipstick cost, it wasn't worth the hassle. First I installed a threaded fitting into the oil pan. I used a bit of Permatex No. 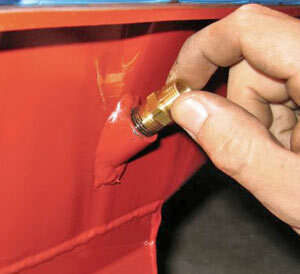 2 sealant on the lower threads to help prevent any leaks. Next I installed the dipstick, along with a compression ring and compression nut, and bolted the dipstick to the motor using one of the header bolts. Lastly, I tightened the compression nut with a wrench to seat the compression collar in order to produce a leak proof seal. Before going much further I decided to get the motor mounted on a stand that supports the engine using the motor mounts (at this point the motor is mounted on a stand that supports the motor from the bellhousing bolts). Since this change needs to be done in order to transport the motor to the dyno shop (the new stand will be much more stable) I figured the switch ought to be done before I get much more stuff bolted on. 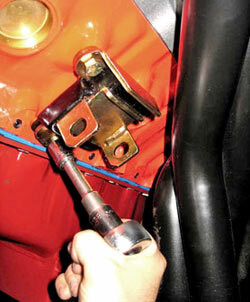 To start I installed a new set of polyurethane motor mounts made by Energy Suspension. 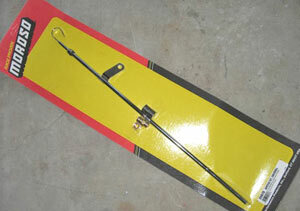 The kit I purchased included two engine mounts as well as the transmission mount. The photo below is of one of the motor mounts. Installing the motor mounts was pretty simple, just three bolts each. I used a bit of Loctite on each bolt and then torqued them to 30 ft-lbs each. 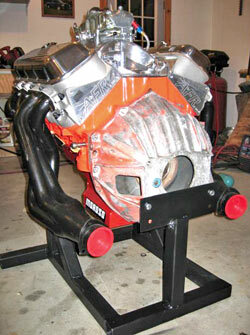 Speed ahead a day or two and I've managed to get the motor mounted on the new stand. Rather than buying a stand I decided to take the time to build my own. In the end it cost me about $40 and a days work to fabricate it. With the motor on the new stand I was able to install the flywheel. Because I'm replacing the clutch it was necessary to have the flywheel resurfaced otherwise the new clutch would have worn very quickly. Here I'm torquing each bolt to 65 ft-lbs in a star pattern. A bit of Loctite was also used to help keep things in place. 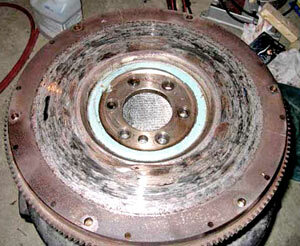 Here's the flywheel as it looked when it first came off the engine - yuck! In addition to having some visible hot spots it also had a measurable amount of taper on the wearing surface - it should be flat and smooth. In the case of this flywheel the surface was showing only a little wear at the outer edge of the wearing surface, but about 1/16" of wear at the inner edge. It looks like a resurfacing is in order! To get things straightened out I took the flywheel down to my local machine shop. About an hour later I was on my way home with a resurfaced flywheel. 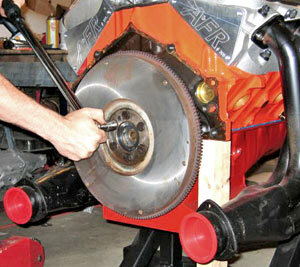 It cost about $40 to have it done, certainly a lot cheaper than buying a new flywheel! One important note, before having them resurface the flywheel I very carefully examined it for any cracks that could cause the flywheel to fail sometime down the road. Also, I verified that the machine shop would not be using a lathe to do the resurfacing. 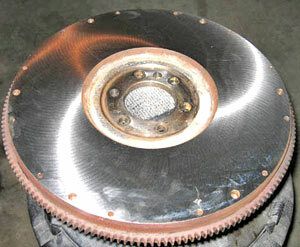 To ensure proper clutch action it's very important that they use a grinding stone or something similar that leaves a non-directional pattern on the flywheel surface. 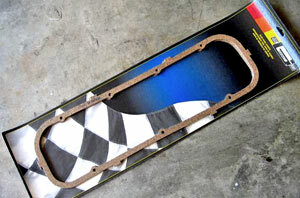 A directional pattern could cause the clutch to grab, chatter and wear prematurely. 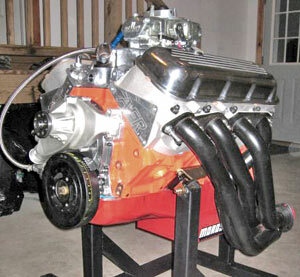 So, below are a few pictures of the motor mounted on the new stand. As you can see the bellhousing has been installed so that two of the transmission bolt holes can be used to help support the motor. It bugs me a bit that the bellhousing looks so crappy at the moment but oh well, it's just temporary! Well, that's it for now. In the next update I'll be installing some of the accessories and (hopefully) the ignition system. I've got some dyno time scheduled for late August so I better get moving! Stay tuned!